Long ago, my mom and I used to venture out in Bangkok a lot. Mom was into importing garments then and we would always say in Pratunam. Of course, it’s where all the fashion and whole sale garments are found. This year, after so long, I revisted Pratunam Park and stayed at Centara Watergate Pavillion. It is a branch of a giant Thai hotel chain leading for MICE (Meetings, Incentives, Conferences, and Exhibitions) facilities and for innovative sustainable efforts in Thailand. 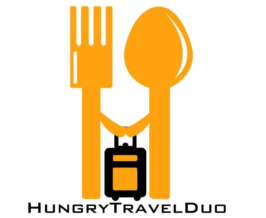 Currently, it has branches located in popular travel destinations in Thailand as well as in some parts of South Asia, Southeast Asia, and the Middle East. More of their branches are still to rise in Thailand and overseas. 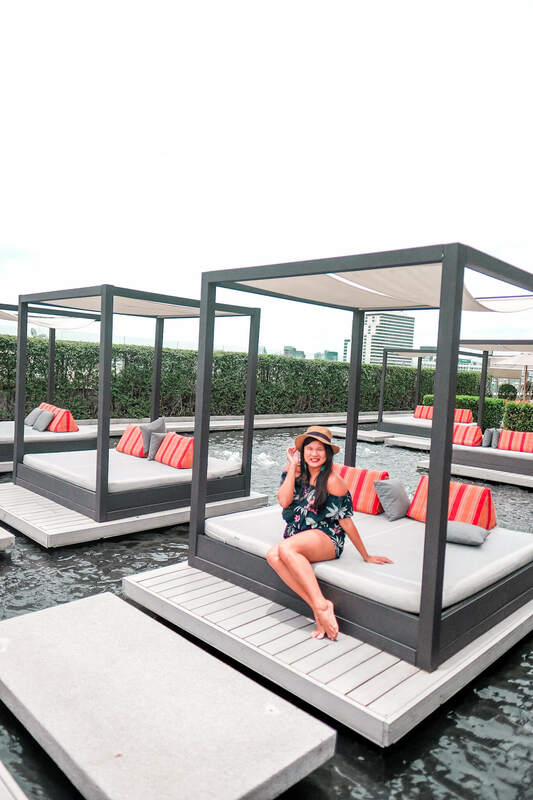 I will enumerate below the reasons why I loved staying at Centara Watergate Pavillion Hotel and, other things you need to know when staying in the hotel. Centara Watergate Pavillion Hotel is literally in the middle of Pratunam (Formally written with space in between as in Pratu Nam). Pratunam is not new to me especially since my Mom and I used to go to this district when I was still a little kid. That was when wholesale garments was my mom’s main source of income. Pratunam is definitely the place to shop for cheaper clothing and other great finds for yourself or your loved ones of any age. Go for a shopping galore in fashion factory outlets, street stalls, and night markets as well as in high-end shopping malls like the Platinum Fashion Mall. These are all within a walking distance to the Centara Watergate Pavilion Hotel. So, for everyone who loves to go shopping, the Centara Watergate Pavillion Hotel is your perfect base in Bangkok. The fusion of minimalistic and modern style gives the rooms the clean look but not dull. The built-in furniture, like the closet, side tables, and TV cabinet, make the rooms and suites appear spacious and futuristic. Then, there’s a huge window to view the busy Bangkok’s urban streets and to allow the natural light to come in. Of course, it comes with curtains you can pull for cover. Basic room and suite facilities include telephone, WiFi access, and TV with cable channels to keep you entertained and connected. For safety and convenience, they are equipped with in-room safe, aircon, hairdryer, minifridge, and coffee and tea making facilities. Oh, and, they use glass water bottles instead of plastic ones. The 281 rooms and suites, or more or less, in the Centara Watergate Pavillion Hotel are stylishly designed based on the wants and needs of an individual, couple, a circle of friends and a family. In addition to the main king size bed, the deluxe suites have an extra sofa bed while the family suites feature one bunk beds specially designed for kids. 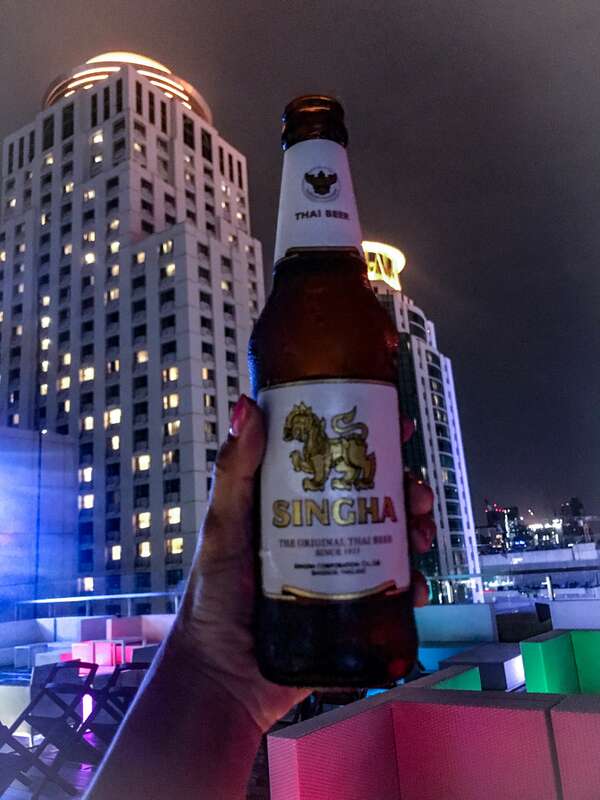 Of course, one of the top things to do in Bangkok is to enjoy rooftop bars. Last time, we’ve been to Lebua and Moonshine. Both are in Bangkok and are equally nice. But, it’s nicer to know that you have one right within your hotel. 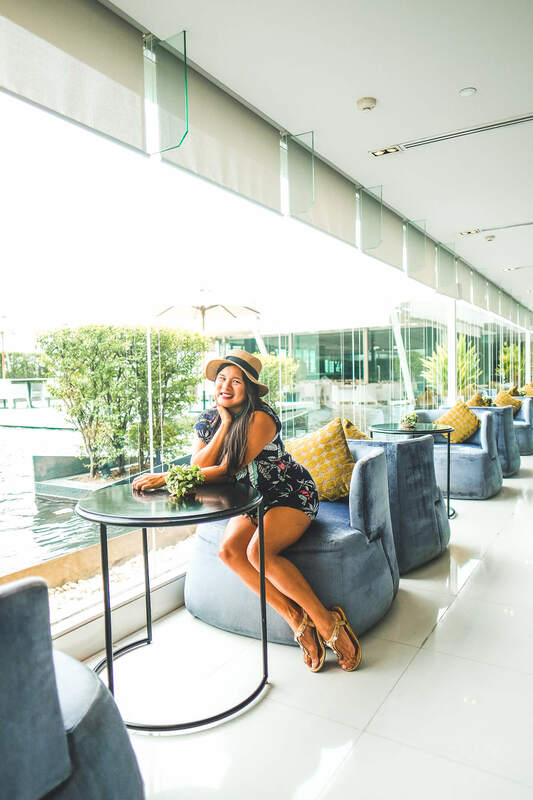 Among the most popular rooftop bar in Pratunam is the Walk located in the Centara Watergate Pavillion Hotel. As it stands 21 stories high, it is higher than most of the other high rise buildings. The Walk rooftop bar used glass panel for the railings so you can enjoy the unobstructed view of the city. As for their plain white but stylish furniture, they turn vibrant through the neon lights coming from the table. The Walk bar is open from 5 in the afternoon until an hour past midnight. When the clock strikes 10 PM, the in-house DJ will start playing music with an interactive video wall in the background. For least around 366 Baht per glass, you can order cocktails usually added with Thai spices like basil, ginger, and lemongrass. 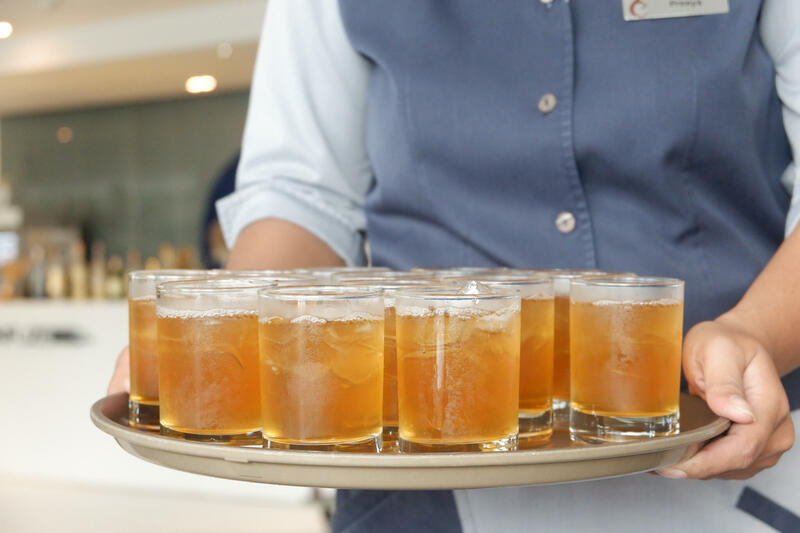 The drinks can then be partnered with Thai snacks such as samosa and fish cake or typical snacks such as deep-fried chicken drumstick or crispy pork with chili sauce. The complimentary breakfast buffet is served at Cafe 9 in the 9th floor of the building. It is is an all-day dining buffet open from 6:30 in the morning until 11 in the evening. Note thought that the breakfast will be served until 10:30 AM. In the breakfast buffet of Cafe 9, they have the usuals like baked goods, salami and cold cuts, and egg and rice. There are more to mentions but generally are western and Thai meals. I liked most their noodle cart and variety of detox juices. The Cafe 9 are very modern and chic from its mural art on the ceiling up to its stylish dining chairs and tables. Overall, the design of the cafe gives that spacious and light ambiance. Plus, it has an alfresco setting near the roofdeck and pool lounge. This will be described in the second to the next bullet. For my friends, they woke up early to head to the on-site fitness gym to stretch and do some lifting. The fitness gym of Centara is fairly decent and features basic equipment like treadmill, stationary bike, and weightlift equipment. To relax and re-energize, the hotel allots space for spa facilities through the Cense by Spa Cenvaree. Here, they perform traditional Thai massage therapy and modern spa treatment. In addition to the usual treatment room, they have Jacuzzi and Herbal Steam Room. Out of my must-haves for hotels, the only thing they didn’t have was a pool to swim in. But, in the lobby, they have an open-air lounge area with sunbeds over a pool. It is not swimmable but is really pretty and Instagrammable. The lounge area of the Centara is a 9 storeys high roofdeck. So, from here, you can get a view of the skyscrapers of Bangkok too. The lobby is decorated with amazing artworks. It represents the whole hotel which is simple but futuristic. It’s a nice photo opp corner. 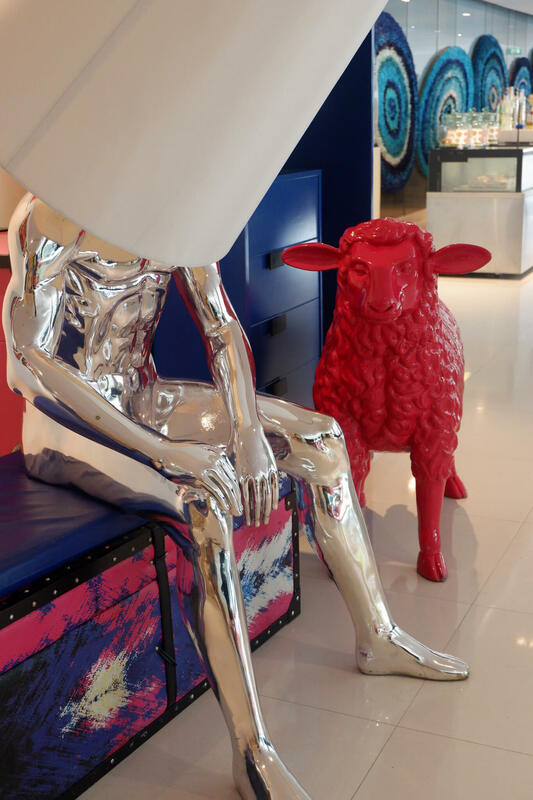 The sitting silver man reminds me of the “Thinker.” It was like he finally gets an idea so his head flickered. While we waited for the check-in registration to complete, we were handed with cold towels and pandan drinks. It was really nice. 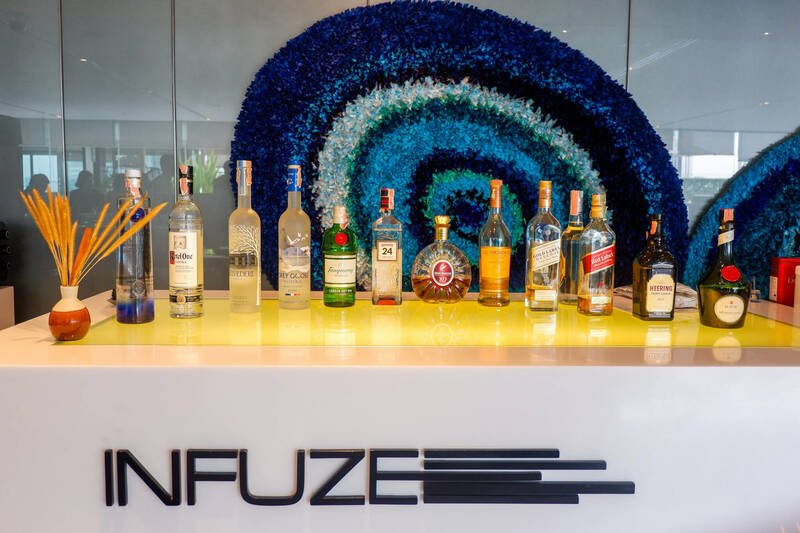 Near the reception area is a bar which is called the Infuze. It is open as early as 10 in the morning and closes at 11 in the evening. Something to try while waiting for the keys to the hotel room. We had a good stay in Centara Watergate Bangkok ( check rates and availability) hope you will too. Thanks to Tourism Authority of Thailand Philippines Branch for taking care of us and housing us in this pleasant hotel during our stay.